1. At the age of 12, Andre was already well over six feet tall and 200 pounds. Andre suffered from acromegaly, which led to his giant frame. Doctors told him he would not live to see his 40th birthday. 2. As a kid, playwright Samuel Beckett gave him rides to school. Since school buses couldn't accommodate Andre's large size, Beckett offered to take him in his truck. According to Andre, all they ever talked about was cricket. 3. He supported himself through wrestling school by working for a moving company. 4. Andre was rejected from the French Army for being too big. The army didn't have big enough boots, bunk beds, uniforms, or deep enough trenches to defend himself. 6. In a feat that would put any drinker to shame, Andre once had 156 beers in one sitting. Andre drank like a boss. In her autobiography, The Fabulous Moolah tells another story of how Andre drank 127 beers and passed out in the hotel lobby. Since none of the hotel staffers could carry the Andre, they draped a piano cover over him and let him sleep in the lobby. 7. And according to Richard English, it took Andre almost two bottles of vodka in order to get a buzz. This information would eventually come handy when Andre went in for back surgery. WWE Chairman Vince McMahon recalls the anesthesiologist did not know how much morphine to administer Andre. So he calculated the amount based on the bottles of vodka it took to give Andre a buzz. 8. Andre once drank 16 bottles of wine in four hours before wrestling three matches including a 20-man battle royal. He could probably outdrink Zeus. 9. He could pick up Arnold Schwarzenegger like a feather. According to Arnold, it happened when he was dining with Andre and Wilt Chamberlain. Upon discovering that Arnold paid for dinner, Andre picked him up out of his chair and placed him on top of a car outside the restaurant. 10. He could easily walk into a restaurant and eat 12 steaks and 15 lobsters in one sitting. 11. A silver dollar could easily fit through one of Andre's custom-made rings. 12. He allegedly flipped a car over with four people inside. According to Arnold Skaaland, Andre was drinking at a bar by himself when four patrons started harassing him. After reaching his breaking point, Andre chased the unruly patrons out of the bar, who then locked themselves inside a car. So, Andre flipped the car over. Lesson: YOU DO NOT MESS WITH A GIANT. 13. The Washington Redskins offered Andre a tryout as a defensive linesman. 14. Andre went on a 15-year unbeaten streak starting in 1972. Hulk Hogan would break Andre's undefeated run after body-slamming him at WrestleMania 3 in front of over 93,000 people. Hogan tore his latissimus dorsi performing the maneuver. Even though Andre's health was deteriorating, he still put on one of the most memorable matches in wrestling history. 15. 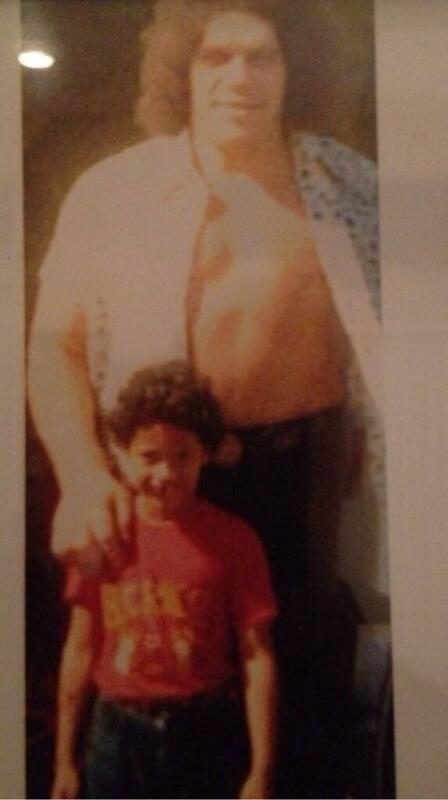 This is Andre posing with a five-year-old Dwayne Johnson AKA "The Rock." 16. William Goldman, writer of The Princess Bride, wrote the part of Fezzik specifically for Andre. 17. According to Cary Elwes, Andre originally thought he only had one scene in the entire film. 18. Andre was heard saying that his favorite part of being on set was that "nobody stared at me." 19. Shepard Fairey's OBEY campaign began as a "happy accident." While searching for an image that would make a great stencil, Fairely was flipping through a newspaper and found the now famous "Andre the Giant Has a Posse" ad. The rest is history. 20. Andre was the inspiration for Hugo Andore from Street Fighter. 21. After his death, Andre was the first wrestler to be inducted into the WWE Hall of Fame in 1993. 22. Hulk Hogan recently announced that the first ever "Andre the Giant Memorial" Battle Royal will take place at Wrestlemania 30. Andre: truly a giant among men.